On March 7th ,2009, at the invitation of New Northeast Electric Company (the former Shenyang High Voltage Switchgear Co., Ltd.), technicians from our company was dispatched to Huanghua Power Plant with JH3000-2 SF6 electric equipment decomposition product detector to carry out inspection on the 8 sets of 500kV tank lightning arrestors of the same batch. We found that the concentration of SO2 and H2S in 7 sets of the 8 was quite high and there was a little CO. Instrument expert diagnosis system judged that severe discharging fault existed in these air chambers but with no decomposition of solid insulating materials; power-off inspection should be carried out as soon as possible; In the other set, the concentration of SO2 and H2S was 8.2µl/L and 2.5µl/L respectively, and there was a small amount of CO. Instrument expert diagnosis system judged that there was local discharging in the air chamber and re-test in half a year was recommended for the purpose of safety. The routine inspections on lightning arrestor carried out in power industry are mainly resistance current, capacitive current and full current. 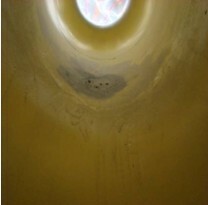 After the discovery of the abnormality, routine inspections and local discharge inspection with ultrasound were carried out and the result showed nothing abnormal. On the analytical meeting held in that evening, a discussion on the problem of lightning arrestor quality and power-off dismantling inspection was carried out. Judging from the content and characteristic component of the decomposing product and with the systematic diagnosis, professional staffs of our company believed that there was severe floating potential discharging in the interior of the equipment. Since common characteristics existed among the equipments of the same batch, power-off inspection as soon as possible was recommended by our staffs. 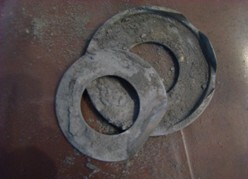 Later on, Phase A and Phase B lightning arrestors of a line was dismantled for site inspection, we found large amount of grey white powder inside both phases (See Fig.1 and Fig.4) and a hole (See Fig.2) broken down by discharging to the shell on the Phase A grading and shielding cover, and there was obvious discharging (See Fig.3) in the inner chamber at the place corresponding to the broken down part of the grading and shielding cover. 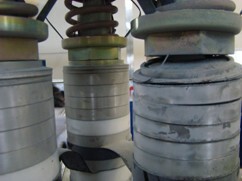 From the dismantled lightning arrestor core, we found there were looseness among resistance chips on a pillar (See Fig.5), quite obvious electrical erosion among the metallic fittings (on the resistance chip mandrel bar), disk spring and washer, of which a breach was formed at the interface between metallic fittings of resistance chip mandrel bar and the disk spring, and the disk spring and washers were burned deformed and deteriorated(See Fig.6). The rest lightning arrestors were returned to the manufacturer for dismantling inspection whose result showed the similar fault with Phase B. 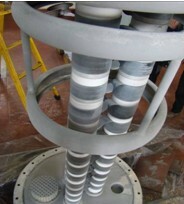 The analysis shows that the fault of these lightning arrestors is caused for the metallic fittings of the resistance chip mandrel bar are not tightened in the installation of lightning core, which vibrates during operation and in turn makes the metallic fittings, disk spring and washers loose which causes floating potential discharging and makes SF6 gas decompose into SO2 and H2S that react with metallic fittings, disk spring and washer, thus producing large amount of grey white metallic fluorid powder. Since the grey white metallic fluorid powder is of polar material, it keeps moving under the influence of electric field. When the powder floats to the gap between live parts and tank inner chamber, discharging to the cover is caused under discharging condition. 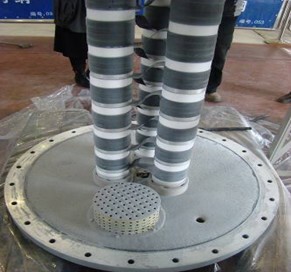 Through this lightning arrestor fault inspection, it is once again demonstrated that the method of inspecting the decomposing product is an efficient means to detect the inner fault of SF6 electric equipments. Our quick response to the customers and high quality professional services are greatly praised by customers.